Of all my courses, 30 day sugar detox tends to be the one that is purchased in flurries around and after times in the year where we tend to do more eating or a time when we reflect on new beginnings. The New Year, Easter, Summer holidays season, Christmas etc. This is fantastic that we have these pivotal points in the year that really condition us to think about change, however, I want to get people thinking about detoxing all sugar or at least a noticeable removal of sugars from our diets all year round. As a Nutritionist, it is one of the things I see so frequently in clinic… those who want to lose weight but struggle to keep on track and those who have had the motivation, ditched the sugar and seen the positive changes to both mind and body – I really wanted to find a way to marry the two as it is those motivated individuals who can so successfully pave the way for others. Many of my clients wish to remain anonymous for understandable reasons, however, in my sugar detox drive, one of my community has bravely stepped forward and agreed to be my April sugar detoxer – sharing her journey with you – the good, the bad and the in between. The journey to good health is not always easy and there are bound to be days when you reach for the sugary goodies to quash a craving… myself included. However, I am here to support that process and encourage you through the hard days and help set you back on track when you do have a fall. I really felt having a ‘real life’ case study would benefit not only my sugar detoxer to stay motivated with the support of all my community behind her, but also inspire many of you to give it a go. The course is 30 days and for a high percentage of those who complete it, many opt to stay sugar free or partially sugar free for life beyond! So, without further ado let me introduce Hermione B, my sugar detoxer who will be updating us on social media weekly and who will be sharing her food pictures, thoughts and progress. I’ll be writing further blogs as we go along, documenting her progress, but for now let’s catch up with her initial goal setting and the first few days of the detox. “So, the sugar detox has finally started after a few false starts. This is because I didn’t start the day with a strong enough intention so mid-morning on Saturday I found myself stuffing myself with chocolate. I’m also compelled to start any diet / detox /lifestyle change with a binge first! 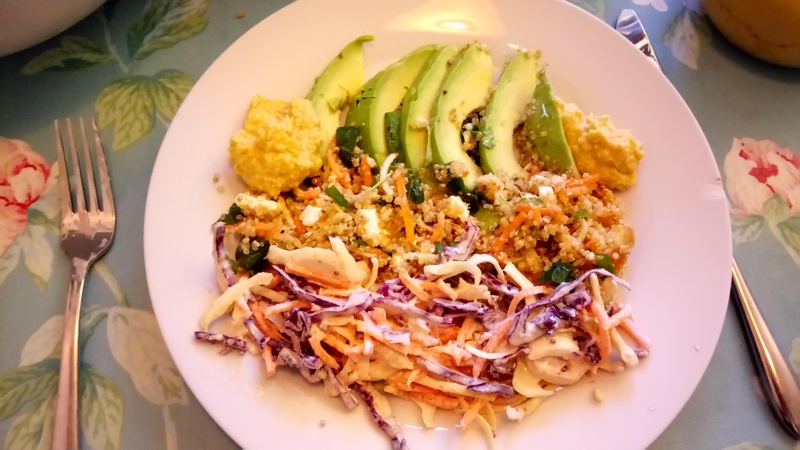 But Saturday evening meal was a delicious combination of rainbow coleslaw, quinoa tabbouleh with avocado & hummus. Pudding was a few blueberries & Greek yoghurt. Sunday morning, I tried the chocolate macca smoothie, much nicer than I thought. I made the mistake of making a second one as I was still hungry…… Then felt ill because I’d had too much! Two lessons learnt there, one Catherine knows her portions and to listen when my body says ‘enough’! Lunch was more of the previous evenings dinner as each dish made a big batch. This is great for me as I’ll just eat it until its gone, maybe adding extra bits. Tonight, I’ll probably add the chickpea burgers. The sugar detox has coincided with spring which is my time of year to get active again. So for the past week or so I’ve been doing some yoga – just a few sun salutations to get the day going, but today yoga was out as today was the first swim of the exercise season! And before breakfast! Which was toasted rye bread, poached egg, hummus & 1/4 avocado. As well as my two morning beverages coffee (sugar free of course) and Earl Grey. I thought it would be good at this point to give you a couple of my top tips for the course that relate to Hermione’s progress so far. It’s common to have a false start when we’re trying something new. I think it’s important to embrace the simple changes you’re making, rather than focusing on what you’re not achieving. Avoid an all or nothing approach… “I’m either on it or off it” … instead, embrace a new way of eating for life that’s packed with goodness and delicious food. You’re right, your taste buds can change so quickly! I’ve tried to add some flexibility into the programme so that it suits different health goals and lifestyles. In the traffic light system, you’ll see that you can vary the amount of carbs you have… for some you may need to be stricter on carbs, especially if you’re looking to lose some weight. Also, some people do better with a little bit of carbs in the evening to help you sleep. So, see what works better for you. 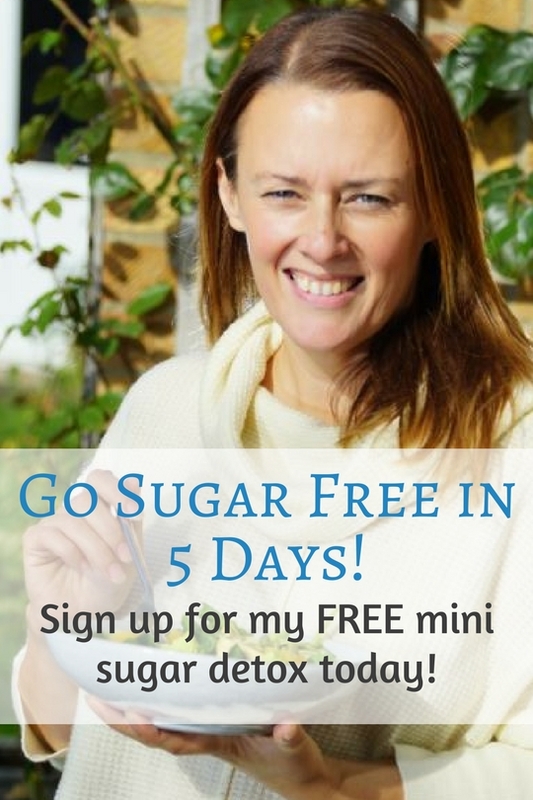 If you want to experiment with reducing sugar, you can sign up for my free sugar free in 5 day programme. Or check out the full 30 day course here! To detox or not to detox? Well, why wouldn't you? Are your farts a sign of gut fermentation?